Relatively few people know about the amount of gold that has been discovered in Maryland. As with much of the gold bearing states along the east coast, most gold strikes were quickly overshadowed by larger strikes in California and other western states. While the gold in Maryland certainly doesn’t compare, there is still opportunities for gold prospectors to find gold worth panning in certain areas throughout the state. Gold was first discovered in the state in early 1800's. although gold was discovered much earlier in Maryland, no commercial mining was commenced until after the Civil War. In fact, after the Civil War, the state was heavily prospected for gold with a few commercially viable being found in the Piedmont Plateau. Most of the gold finds in the state are in the central and the northern regions in the state. You can find both lode and placer gold in the state. Due to the fact that the production in the state was not high, most of the gold mines have since been closed and are mostly forgotten. Most of the old gold mines are located in Frederick, Baltimore and Howard counties. The majority of the gold that has been recovered here is found in the northern and central parts of the state. Unlike much of the gold on the east coast which are limited to glacial deposits, there are actually lode gold deposits present here, with several dozen mines that have been worked since the original discovery of gold. Peak recorded production of over 1000 ounces of gold just prior to World War II. While most mines in Maryland are now abandoned, at one time they were actively recovering gold from hardrock sources. Prospectors today should focus near areas with past mining activity. Most success will be found around old mine sites or immediately downstream of known gold deposits. Several old mines locations are actually within a few miles of the US Capitol Building. Most of the gold from Maryland has come from around the Great Falls area on the Potomac River. Other areas worth investigation include Libertytown in Frederick County, Catonsville in Baltimore County, and the areas around Woodbine and Simpsonville in Howard County. This is one of the major gold counties in the state. Here you can find gold in quartz veins in the Catonsville region. Gold is also found in several other places within the county. Frederick County is dotted with a several old gold mines especial in the region around Liberty. You can also found gold in several other places and on the mine dumps of these old gold mines. The Maryland Mine near Simpsonville is the main testimony to the occurrence of gold in this county. This mine was once the richest gold mine in the state. It was known for the production of gold in quartz veins together with pyrite and silver. There are also several other old gold mines around the Woodbine most of which produced silver with gold as a byproduct. Montgomery is another major gold County in Maryland. The county is home to the Great Falls region, which was surrounded by several mines most of which produced gold. The major gold mines near the great falls are the Great Falls Gold Mine that produced both gold and Tetradymite. As previously mentioned, some gold here may be found in specimen form as small veins and wires scattered among quartz rock. Don’t expect anything huge, but it is possible to find a nice gold in quartz specimen. Panning will most likely result in finer placer gold. Be mindful that the vast majority of Maryland is private lands, so landowner permission would most likely need to be attained. There may be some state owned lands that would allow prospecting but you will want to check with the Maryland Forest and Park Service before you do any digging. 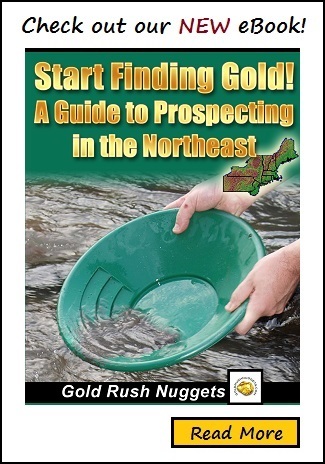 We have two eBooks about gold prospecting in the Northeast and the Southeastern U.S.
Read more on our Gold Mining eBooks page!